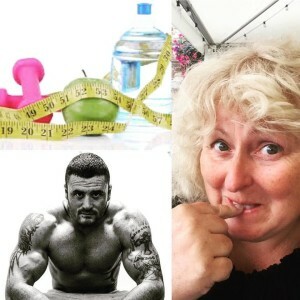 I lost a pound and a couple of inches off my hips last week, which was week 3 and my third weight loss in three weeks – which has a bit of a ‘Power of Three’ ring to it. I could actually have done better, but I strayed off the plan midweek after losing the will to live while knocking out some 4am starts for work! Still I’m heading in the right direction and that’s a good thing, because I don’t want to incur the wrath of ‘the man with the plan’ – Irish Defence Forces soldier and sniper, Peter O’Halloran. 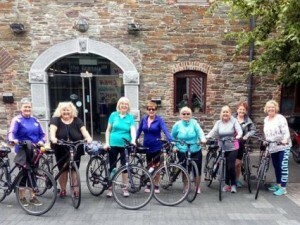 I had a chance to join a bunch of gals cycling along the Greenway in Waterford at the weekend, which was brilliant and definitely something I’d recommend. For some reason though, I rented a bike instead of bringing down my own and I paid for it with a bruised bum. I’m sure if I wasn’t carrying an extra 8 stone it wouldn’t have mattered, but after 10k the unfamiliar saddle was making itself felt, at 20k I was no longer able to sit down, and at 25k, I was calling it quits at the halfway mark and promising to return again another day. In fairness to myself, I had actually woken up at 5am on the morning of the cycle with a tummy bug, so the universe had rather stacked the odds against me. On this occasion I don’t regret bailing out. I’m not normally a quitter, but I was too uncomfortable to enjoy going any further. This way, I loved what I saw and I’ve got something to look forward to achieving in the future. It was really good to meet up with the girls too and it reminded me how much fun we lot had, hiking out in the hills together. That’s something else to start doing again. The rest of the weekend was taken up with the world of swimming and kayaking. 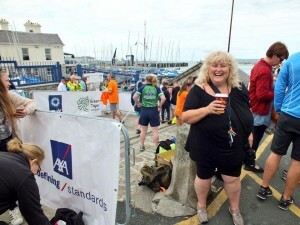 I was helping out with some social media for the Dún Laoghaire Harbour Race, as part of the Leinster Open Sea swim series,. My Lough Erne wingman Stephen Turner was back out on the water doing rescue cover for the 2.2k swim course, which sweeps out across the mouth of the harbour. It was a stunning day, flat calm, hardly a jellyfish in sight and even a burst of sunshine from time to time. It was lovely to bump into so many of my swimming friends and kayaking friends, and the atmosphere was really fun and uplifting. Everyone kept asking me why I wasn’t swimming, and I confessed that I’ve always been quite nervous of the Harbour Swim. It’s a big swim, with big currents and frequently choppy swells out near the harbour mouth. I really am in awe of the swimmers who finish the course, not to mention the elites who carry handicaps of up to SIXTEEN MINUTES before setting out after the rest of the field. I wouldn’t have to win it of course, I’d just have to complete it. As quite a few people pointed out to me yesterday, I can no longer use the excuse that the distance is too long, after managing the 5k Lough Erne solo in Eniskillen a couple of weeks ago. So I guess I have just selected my first challenge for 2018! you are inspiring to me Teena well done on your persistence achievements and general doggedness! !